Summary: Lester Musselbaum is starting fifth grade after being homeschooled by his mom all his life. His father was an astronaut who was killed in an accident when Lester was five. Lester loves science, especially astronomy, but is apprehensive about going to public school. He struggles in the first few weeks with a couple of mean boys, too much noise in the cafeteria, and a teacher who sometimes makes last-minute changes to the schedule. His inclination at such times is to run away, but he gradually learns other coping strategies. A girl named Abby becomes a friend, and a diagnosis of Asperger’s leads to an IEP that makes school a little easier for Lester to handle. There are still good days and bad days, but Lester begins to see his strengths and to use them to make his way in a new world. 336 pages; grades 3-7. Pros: As I mentioned in an earlier post, I fear that “give this book to fans of Wonder!” is becoming a tired cliché. 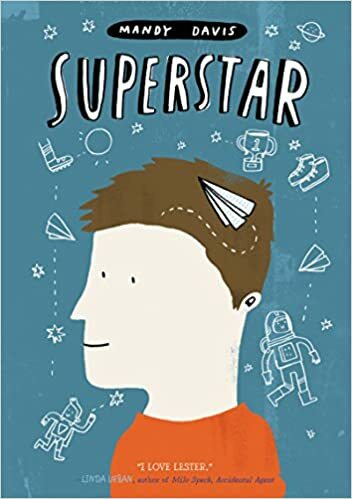 However, the comparison is inevitable in this engaging tale of a fifth grader with a difference that sets him apart from his peers. First-time novelist Mandy Davis does an outstanding job of portraying Lester sympathetically yet realistically. I read this book in less than 24 hours. Cons: Teachers and other school personnel seemed unnecessarily nasty at the beginning of the story, although they improved as time went on.